Primary or Secondary Research for Equity Research Report? Equity Research » Equity Research Report » How Much to Rely on Primary/ Secondary Research for Your Equity Research Report? A lot of you have written to me stating that you have read and appreciated my earlier article – ‘Which is the best way to collect information for your equity research report’, wherein I had explained how to go about collecting and collating information for your equity research report. Many readers said that they tried the methodologies I had suggested in the article quite successfully and were able to collect excellent data for their equity research reports. But I did get a few emails wherein some readers were still not very sure which is the best type of data collection methodology – secondary research or primary research. They were not sure how much to rely on secondary research and how much on primary research when they were writing their equity research reports. I know this is a quandary faced by many analysts when they are gathering information. In today’s times of limited resources, where analysts are supposed to churn out equity research reports on a regular basis, it becomes extremely important for them to decide when to stop, how much is enough and what to trust. Believe me, these are not easy decisions to make. This will definitely come to you with more experience as you write more and more equity research reports. But I thought that I’ll try to use my experience and write another article where I will try my level best to tell you guys how to use the information that you get from secondary as well as primary research techniques. Which information to trust more and when to stop the process of data collection! Secondary research techniques include techniques where you collate information from something that is already out there – something which is previously published on any public platform. That information could have been printed in the company financial or accounting reports, press releases of companies, websites of various organizations and associations, industry and segment reports, research reports by different associations, tabloid articles, the research report by market research firms, and other such published literature. Though secondary research techniques seem to be quite unassuming, you need to be able to mine the World Wide Web resourcefully and optimally to get the best possible intelligence accessible out there. Do not be lazy when you are searching the Internet. Most people do not go beyond page two or page three in a Google search. But believe me do not stop at that. Many good and useful articles might not have been SEO (Search Engine Optimization) tagged properly and you might miss out on them if you do not show patience in mining the Internet properly. The biggest problem with collecting information through secondary research is that the information available could be out-dated or old and hence could result in inaccurate outcomes. Another thing to consider is that the previous studies that were conducted may not have targeted the same issue that the current research project requires. So you have to be careful to figure out how dated the data that you find through secondary research is. Also, remember that you need to provide the correct and appropriate sources for all the data that you collect from secondary research to authenticate it. Also be clear as to which sources you are using for your data collection. Do not trust anything that you see on the Internet blindly. Especially beware of propaganda used by various corporate entities. Many times companies will put stuff like “we are the leading company in Europe”, or “We have nearly fifty percent of the market share in Europe” or “we are the number one company in Europe” on their websites. Do your research properly, find the actual facts and only then publish your findings. Primary research techniques mean collecting the information directly from the horse’s mouth! It includes speaking to several key participants in the industry, interrogating them and gathering latest intelligence about the organization as well as the industry. Primary research can be quite challenging as you need to first identify the correct respondents you would want to interview, then somehow persuade them to dialogue with you and then actually interview them in depth. This requires a lot of elicitation skills and you need to practice this. You might have to follow up with these respondents again and again and might also need to offer them incentives to talk to you. The biggest drawback of primary research is that it cannot be verified or audited. Many times respondents are ready to share information but anonymously. They don’t want to be quoted or traced back to the source of the information. So it becomes very difficult to source your information and validate it. Also many times respondents can also take you for a ride. So you need to be very careful as to what information you get and how authentic it is. Also, another important thing is to understand exactly whom to choose as a respondent and what questions to ask him or her. Do not believe what a single person tells you and always try to verify it by talking to multiple respondents. That way you can increase your level of confidence when it comes to data collected from primary research. I always believe that primary research starts where secondary research stops. They have to be used as complementary research techniques rather than competing or alternate research techniques. You should always be prepared for your secondary research before you start collecting information through primary research techniques. Primary research should be used to fill in the lacunae that are there in the information that you find through secondary research. 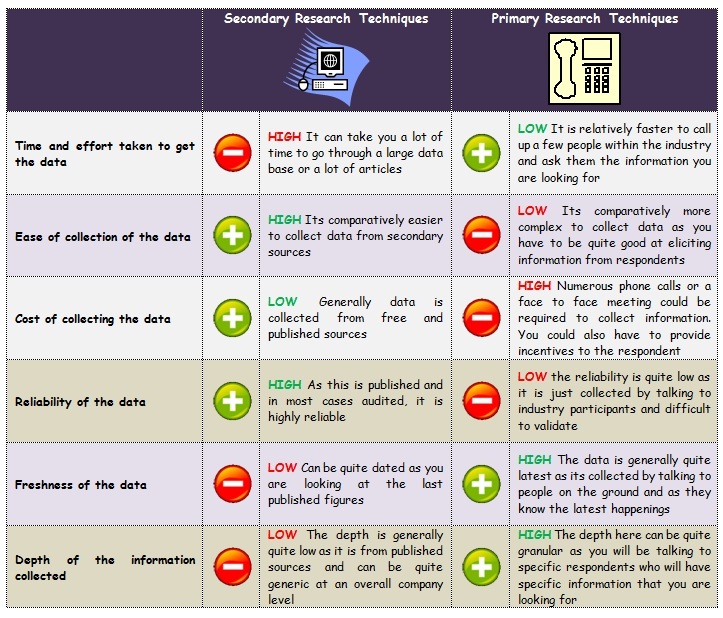 I have created this below simple table where I have clearly tried to depict how secondary research techniques and primary research techniques fare against each other when compared to various parameters. So if you ask me there is no obvious yes-no kind of answer to the question whether primary research is superior or secondary research is superior. An efficient equity research analyst will quickly identify how to utilize both these types of research methodologies - primary research and secondary research in his data collection and how to synthesize the data collected through them in a systematized manner. But to end this article I would say that you should always rely more on secondary data which is augmented by information that you can elicit from your primary research techniques. I hope I have been clear about the importance of primary research and secondary research when you are collating information for your equity research report. Just to reiterate, you have to use both of them together to get the optimum value for your findings. They might not be in a position to provide sufficient intelligence to you. Do let me know if you have any questions regarding this article and as usual, I will be more than happy to answer them.